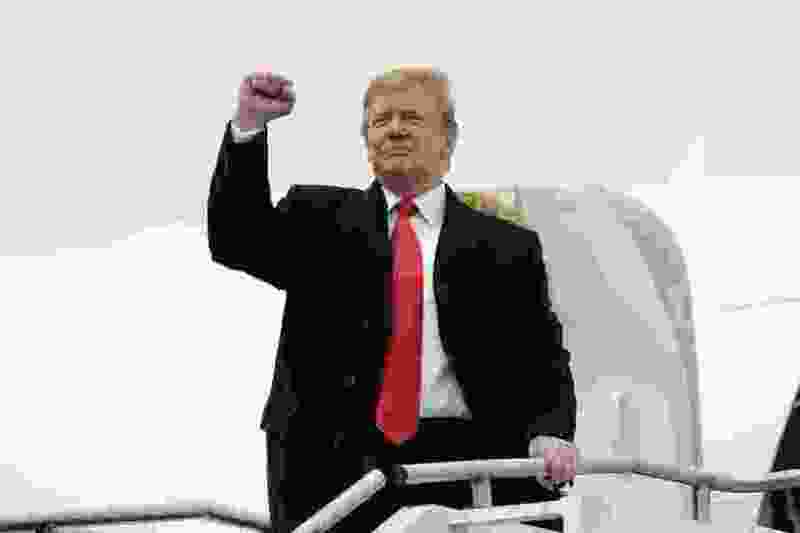 (AP Photo/Evan Vucci) President Donald Trump arrives at Lima Allen County Airport, Wednesday, March 20, 2019, in Lima, Ohio. Washington • In refusing to release his tax returns, President Donald Trump bucked decades of tradition and set off a Democrat hunt to obtain them. Now several statehouses are looking at making their release a condition of the 2020 presidential election: Show us your tax returns, or you can’t be on the ballot. Proponents of the bills, such as the one passed by the Washington state Senate this week, say they are aimed at increasing transparency and returning to the “norm” of candidates releasing their financial records. But Democratic lawmakers behind the some of the legislation have admitted they are also very much about Trump, which raises legal and political questions about how far states can — or should — go in regulating who appears on their ballot, especially in a hyper partisan climate. Trump has long insisted that he won't release his returns because they are under audit, though that would not preclude him from doing so. The documents have become something of a liberal white whale, and Democrats at federal level have been pursuing laws or legal maneuvers aimed at obtaining them. "It is so obvious with this president that had voters known some of what seem to be his business interests, he may not have been elected president," New Jersey Sen. Loretta Weinberg, a Democrat and co-sponsor of the bill approved by the state senate last month, told the Courier-Post. Similar attempts have been made by states since Trump was elected. In 2017, Dan Diorio, policy specialist in NCSL, noted that at least 25 state legislatures put forward such bills. "Nearly every bill has been introduced by Democrats, in reaction to President Donald Trump's refusal to release his tax returns as per the custom of previous presidential candidates," he wrote of the 2017 legislation. While Democrats appear to be driving these bills, Dan Weiner, a senior counsel for the Brennan Center's democracy program, told The Post that there was bipartisan support more generally for increasing transparency around presidential candidates' finances. "It is always true in American politics that these ideas are championed by perhaps the side that has more of political grievance at that particular moment," said Weiner. "That doesn't mean it's not a good idea." And not all politicians think this kind of legislation is a good idea. In 2017, former New Jersey governor Chris Christie vetoed one bill that made it to his desk, calling it "politics at its worst." Former California governor Jerry Brown, a Democrat, did the same when California's legislature passed similar measure. "First, it may not be constitutional," Brown wrote in his decision. "Second, it sets a 'slippery slope' precedent. Today we require tax returns, but what would be next? Five years of health records? A certified birth certificate? High school report cards? And will these requirements vary depending on which political party is in power?" Richard L. Hasen, an election-law expert, considered the legality and prudence of these measures in Politico Magazine. While Hasen argues that cases for and against constitutionality could be made, Democrats might be opening a "Pandora's box" by pursuing it. "Will solidly Republican states allow electors to vote only for Republican candidates for president?" he wrote. "If the tax gambit is okay, then such a law might also be constitutional. Or perhaps the GOP would retaliate with laws aimed at voter suppression or other such measures that target typically Democratic constituencies." Plus, Hasen writes, "no doubt as soon as they are enacted, such laws would be challenged in court. Trump would already have standing to challenge, as he declared his candidacy for reelection in 2020 on the day he was inaugurated. There's plenty of time for courts, even the Supreme Court, to work out the issue before 2020 ballots would have to be printed in any state." When Sen. Elizabeth Warren, D-Mass., a Democratic presidential candidate, called for the abolition of the electoral college this week, she put a spotlight on several states' efforts to reform that system. Twelve states and the District of Columbia have signed on to the National Popular Vote Interstate Compact, in which states pledge to give their electoral votes to the winner of the popular vote. However, not enough states have signed on for it to have an impact on the 2020 presidential election.